When people think about traveling to the Midwest, or Sheboygan in particular, during the spring, summer or fall, they more often than not are in quest of an adventure that involves 1 of 2 highly sought-after Sheboygan County adventures; golf or fishing. Now, we have world renowned golfing in the area, but this article is about the fishing… not any fishing, but the kind that involves a fish that can only be found in a very small demographic of the world. The fish I am talking about happens to be fresh water trout and salmon out of Lake Michigan and its tributaries. When those who seek salmon or trout on Lake Michigan out of Sheboygan, WI, they usually think of charter fishing. Now, we, (Wolf Pack Adventures) do have a fleet of boats fully equipped to take your group on an adventure to do so, but I would like to get into other options in this article. Kayak, spin cast, and fly fishing. Say what?! Yes…these highly sought after trophy fish are certainly an option that everyone should consider! Have you ever been standing in knee-high water in waders with what looks and feels like torpedoes cruising up the skinny water directly at your location hoping they dart in another direction so they do not connect with a direct hit on what seems to be your only stability in the slightly running current? Or… been pulled around in a kayak down river by a 30-pound fish that has enough power to make you look like a fool? Now comes the best part…the chance to land those fish successfully once they bite your presentation for the picture of a lifetime. I’m sure you are sitting there reading this saying to yourself that I sound like I fell off my rocker. Well, kinda!! The adrenalin rush that comes over you when a high 20 to low 30 lb. fish crushes a Maglip on your retrieve while you’re basically sitting on water, if fishing out of a kayak, only to get tail splashed not once but certainly guaranteed at least twice, right when you thought the battle was over and you conquered the beast is unforgettable. If that is not your style, and you would rather test your precision and patience, you can stand in the water in a pair of waders with the current rushing around your legs and the fog lifting up around you because the water is warmer than the air. You can concentrate on where you are ever so gently laying that fly down on the water to entice that 20 lb. German brown trout you sighted sitting in the slack behind that one boulder that’s breaking the current. As you try to place that perfect landing, so your fly swings and changes direction at the perfect time to entice the trophy trout, a pair of mallards appear out of the mist only to almost take your head off making you react real quick while losing your footing, only to regain your composure and start that perfect series yet again. If you think these sound amazing, but you are the type of person who wants to relax, not work so hard, still do some fishing but have the time to sip on a beverage and smoke a good cigar while you do some business with a future client… Well, you can still experience all of these things by simply soaking spawn or shrimp with a lil’ corky or cast spinners making a flash that the fish just cannot resist. Spring, as soon as the ice is out and the rivers are open, is a great time to kick off the cabin fever. The tributaries to Lake Michigan are choked full of steelhead and browns. You can keep track of what is going on by visiting Lake-link for current fishing reports and pictures. 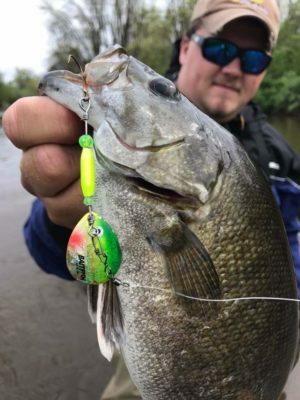 The main methods of fishing these fish are off the banks if the current is flowing too fast with casting spinner blades, casting Maglips, or find an outlying point, get on the end of it and set some rods tipped with Spin-N-Glo’s, shrimp or spawn. During the summer, if you are looking for a quick trip to catch fish, you will have a hard time finding trout and salmon since they dish out back into Lake Michigan. But, these same rivers are full of really nice bass and pike offering up really good fishing! Again use Rooster Tails, Maglips, or anything your little heart desires. Now we get to the fall. When you start seeing all the charter boats congregated in front of the harbors and people fishing off the breakwalls, start paying attention to the fishing reports on Lake-link again. Those salmon are starting to stage only to make their migration up into the rivers to spawn and die. This is the end of their life cycle. They run up into the rivers to lay their eggs. When you start seeing these fish that look like zombies jumping 4 feet out of the water, this is when they are breaking their eggs loose to lay. Generally, you have two to three more weeks of good fishing…that is for salmon. Once salmon start laying eggs, the big brown trout and steelhead come up into the rivers to feed on the eggs. The best methods for catching these fish are Maglips and/or crankbaits for the first two weeks. Then, it switches to a fly bite and streamer flies for two or three weeks. Once the fish start releasing their eggs, now is the time to switch over to spawn sacs behind a Spin-N-Glo. If you have a fish that just will not eat anything, let a Maglips wiggle in front of its face again…he will eat. As time passes the salmon are done and gone. Its getting cold. Deer season is going to be starting…grab your spin cast rods and bank cast for beautiful coho salmon with that deep red stripe and big hook jaw!